Coventry Village Trick -or-Treat. 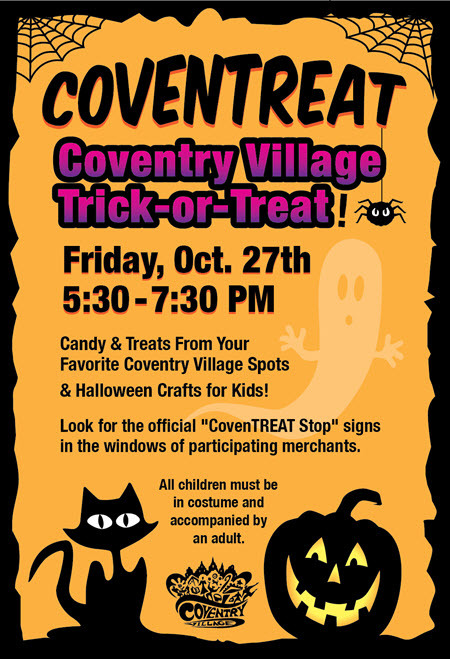 Candy, treats, and Halloween crafts from your favorite Coventry Village spots. Look for the official "CovenTREAT stop" signs posted at participating locations. 5:30 - 7:30 Stop by Chipotle Mexican Grill in Coventry Village. All kids in costume will receive a Free Kids Meal Card. Please note: All children must be in costume and accompanied by an adult.